As residents of Brooklyn and Queens know all too well, not having a car makes it difficult to get from one borough to the other. Buses are maddeningly slow, most subway lines require a detour through Manhattan, and a cab or Uber quickly becomes expensive. “I have friends who live in Astoria I don’t see because it’s hard to get there,” said James Bednark, who works in television production and lives in Prospect Park South, Brooklyn, only 13 miles away. Soon, however, there will be another option: hopping into an unnervingly small, but surprisingly roomy, two-person vehicle and motoring to the other borough, where the rental ends once the driver parks. The move marks a critical step in the so-called sharing economy’s transportation segment, which once seemed a pipe dream of environmentalists and now includes such mainstays as Zipcar and Citi Bike. 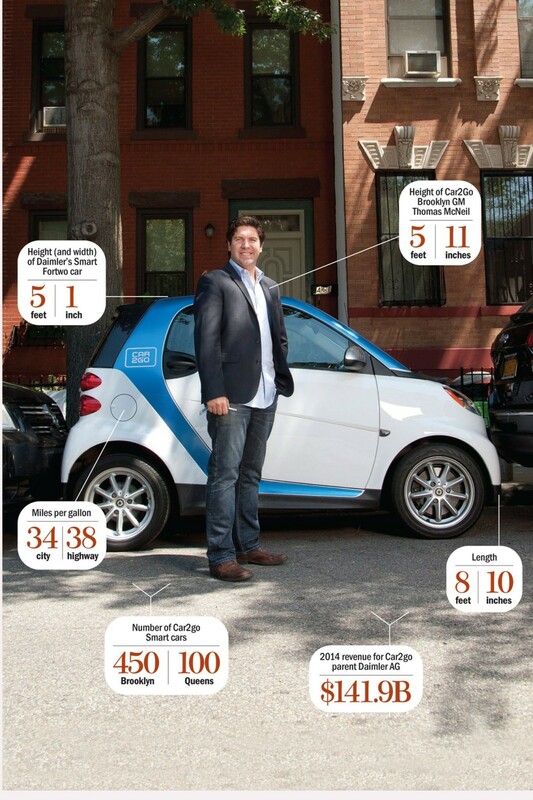 With its fleet of Smart cars that users can locate, reserve and open with a mobile app, Car2go could complement the transit system and help fill a hole in the way people get around. Or it could just bring more congestion to neighborhoods where it’s already hard to park. The most important data about Car2go may be coming this fall in a study by Susan Shaheen, a co-director of the Transportation Sustainability Research Center at the University of California, Berkeley. It will look at the company’s impact on five North American cities and whether its one-way model reduces car use and ownership and greenhouse-gas emissions, as Zipcar’s round-trip model has been shown to do. In the meantime, Ms. Shaheen said, Car2go has some advantages over others in the car-sharing industry.